Philip Firth shoveled cotton seed to feed cattle on his property. “I’m convinced he turned the tap off,” Mr. Firth said, referring to God. The Rev. Bernard Gabbott bumped along on a road so remote the asphalt had given way to gravel, heading out to see a farmer who had been working seven days a week, straining to keep his cattle and sheep fed. He pointed to an empty patch of earth. The farmer had plowed it to plant as pasture for his livestock, but instead, the afternoon wind kicked up clouds of dust. “It’s been like that for months,” Mr. Gabbott said as he pulled up to a small farmhouse. When he arrived nearly a decade ago in Wee Waa, a small town surrounded by scrubby farmland, Mr. Gabbott’s mission seemed straightforward. He was the vicar of the town’s small Anglican parish. His job was to bring people to Jesus. But now, he has found himself wrestling with a far more complicated reality. 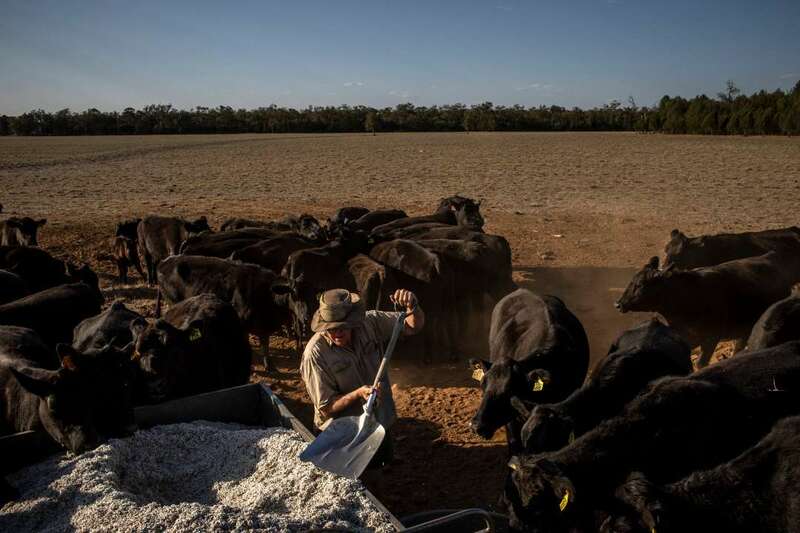 With the worst drought in decades threatening a way of life in Australia’s rural communities, he has become a one-man support system for earthly concerns. He is a counselor, a social worker, and a philanthropist drawing from his own modest funds. At times, he provides solace; in other moments, he must convince hard-pressed families to set aside their pride and accept vouchers for the grocery store. The repercussions from the drought — now affecting a stretch of Australia larger than Texas — seem almost biblical. There was the town swarmed by famished emus searching for food. The crops overrun by feral camels migrating toward water. Around Wee Waa, it has been the kangaroos invading soccer fields and crowding roadsides after dark, their carcasses littering the pavement in the morning. But the consequences have been especially brutal for livestock farmers, who have been forced to sell off stock and take on mountains of debt. Hanging over everything else is the specter of harder times to come, leading many to reckon with the potential devastation of their livelihoods and their communities. “I think there are two droughts going on,” Mr. Gabbott said. The farms are endangered. So is the town. Wee Waa, a onetime cotton capital a few hundred miles northwest of Sydney, is one of many rural communities in a part of Australia enduring its driest year since 1965. Scientists have shown that climate change makes Australia’s droughts more severe, but many farmers said the cause matters less than their immediate needs. Ron Pagett, 75, farms on thousands of acres on the edge of the Pilliga Scrub, an expanse of scruffy woodland. Mr. Pagett, 75, has lived through other droughts, but he figures it will take years to stagger back to profitability from this one. Mr. Gabbott said it was a response he heard often: farmers refusing charity, playing down their troubles. “I’m convinced he turned the tap off,” said Philip Firth, who raises cattle and sheep on land where Mr. Gabbott’s young sons have been learning farmwork, referring to God. More than $1 billion dollars have been made available by officials to support agriculture. More recently, the prime minister, Scott Morrison, Australia’s first Pentecostal leader, has urged the nation to pray for rain. It’s a common refrain. Here in the sweep of Australian farming country, where land is measured by the thousands of acres and the horizon consists almost entirely of different shades of brown, there has been a flood of entreaties for divine help — at dinner tables, in schools, at gatherings of friends. He is a convert to rural life. Mr. Gabbott, who is gregarious and quick to laugh, grew up in Sydney, the son of missionaries. He had a brief career in politics working with the conservative National Party before entering the ministry. For nearly a decade, he has lived in a century-old house behind the church, where his wife home-schools their children — Seth, 12; Baxter, 9; Elsa, 6; and Sage, 4. The shiplap walls are covered with stickers, family portraits and a timeline of Australian history that stretches across the kitchen. There is no television, but overstuffed bookshelves are everywhere. The parish owns the house, and Mr. Gabbott said he couldn’t afford to buy his own if he wanted to. He and his wife, Anita, could probably earn far more if they moved; they have a half-dozen university degrees between them. Even before the rain stopped falling, Mr. Gabbott, 43, could see the families moving away and the shops on the main street emptying as farms needed fewer workers and residents were drawn to bigger cities. He could sense the apathy that pervaded Wee Waa, a town of about 2,000 people. The drought has only accelerated that decline. It’s tugging on the community’s already-fraying fabric, imperiling the entire town. He has tried to hold together what he can. He assembles a slice of the community on Sundays, when he stands at the front of his brown-brick sanctuary in the center of town, reads from the gospel and delivers sermons that, as some of his congregants joke, he takes his sweet time to unspool. But these days, most of the work comes during the week. He is a constant presence in Wee Waa, dashing around in a T-shirt and sneakers. (Long distance running is his diversion from ministry). Most of the people he encounters will never join him at church. Instead they drop by his office — his regular corner booth at the town bakery. Or they listen to him teach scripture at school or they run after him as he crosses the street, asking to borrow his car, which he lends them, even though last time it was returned badly dinged. Sometimes, in his “existential moments” as he puts it, he questions if he’s effective. He has noticed a slight uptick in church attendance but the offering is dwindling. In nine years, he has converted one person, a cotton farmer he reads the Bible with every Monday. Now, he said, his church might not make it: It’s just months away from not being able to afford his wage. When Mr. Gabbott was in Bible college training for a rural church, another pastor gave him some advice. Learn how to work on a farm. A family paid him $1,000 for 10 days of work, and then he kept at it. Over time, he found that, out on the land, men would open up, their minds distracted, their eyes focused on the job at hand rather than the person they were talking to. In small towns like Wee Waa, the figures who are pillars in community life — teachers, police officers, pastors — are often just paying their dues and passing through. “It often takes people a long time to trust who’s there,” Ms. McClenaghan said. Mr. Gabbott’s willingness to hang around has changed him, and Wee Waa. He offered funerals as evidence. He averages one a week, and many of the deceased were never regulars in his pews. Yet they requested him. Even Catholics in town have asked to have their funerals in his church with him presiding. The strength of that bond has made a decision about his future all the more agonizing. He does not want to leave his parish without a pastor. He does not want to leave Wee Waa. But on a long drive back from one of his scripture classes, he told me there are moments when he feels like he is running out of time. We were side by side, our gaze fixed on the pavement ahead. The two-lane road was surrounded by sun-baked fields that looked as if they never ended. Everything was brown. Even the clear sky seemed stained with dirt. Moving his family out of Wee Waa seemed increasingly possible given the church’s finances. But he was reluctant to go anywhere else. Instead, he was scouting for second jobs. Maybe he could work as a farm hand or in the bakery a few days a week. Sure, he conceded, he wished he’d had more than the one convert. But he’d come to believe that tending to mortal concerns, however minor, was more than busy work. “We’re actually getting traction,” he said. He felt compelled to see Wee Waa through the droughts, on land and in town. His work wasn’t done.